Walk with us at Moving For Life's 2017 Hike-A-Thon on Sunday, Sept 17th! Register today to rally your friends and family behind our work in getting people moving when moving gets tough. I donated in support of this campaign on Shu-Mei Chan's page. "Sorry I missed this, but happy to donate to the cause. XOXO Patricia"
I donated in support of this campaign on Leta Weintraub's page. "Your inner strength, determination and optimism is an inspiration to all cancer patients and survivors ! " I donated in support of this campaign on Ana Bella's page. "Cheers to your health and to a great cause! xoxo"
"Glad I wasn't too late!" "Congratulations Leta! Kathy and Dave"
I donated in support of this campaign on Hope Reiner's page. I donated in support of this campaign on Martha Eddy's page. "Ivy, you inspire us! " "Many thanks to YOU Hope for all you do for Moving For Life & those who want to get moving in their lives. Join me in walking in honor of Laurel Kamen"
"You are at the CORE of our mission! Thanks 4 extending sharing your gifts, and joining me in honoring Catherine's husband Charles Samuel Thompson." "Thank you for all the ways you MOVE for Good! " "Thanks for hiking with Moving For Life!" "A wonderful cause and inspirational person!" "Anything my dearest friend feels passionate about and is willing to walk for is wonderful." I donated in support of this campaign on Hon Chen 's page. "Good luck on this great cause!" I donated in support of this campaign on LuLu Meng's page. We are fundraising to strengthen our wellness programs in the hospitals and public libraries of Harlem, Bronx and beyond. Along the way, Moving For Life will lead health-giving stretches and teach you how to turn any park into a green gym. Everyone will also receive a Moving For Life button. Hikers reaching sponsorship thresholds receive limited-edition Moving For Life hats and/or backpacks. Top off the day with a visit to the Cloisters or have lunch in Fort Tryon Park. To start rallying sponsors today, simply click Start Fundraising Now and we'll guide you through the steps through easy-to-follow directions and handy tools. This year, we would also like to invite all to join TEAM JOHNNY, a special hiking team led by Louisa Cathcart, a recent Moving For Life Certified Instructor, focused on launching Moving For Life classes designed for kids and young adults affected by cancer. Alternatively, if you'd like to join the hike WITHOUT fundraising, click here to learn about our Rally-Walks. Can't join us on the journey? Consider sponsoring one of our hikers at the bottom of this page. Or you may donate to the campaign in general too! With your help we can strengthen our thoughtfully-designed programs that empower people to start feeling better in the face of cancer and aging. We thank you for your generous support! Online Registration: Simply start a fundraising page and pay the registration fee by donating to your own hike or through sponsorship dollars. 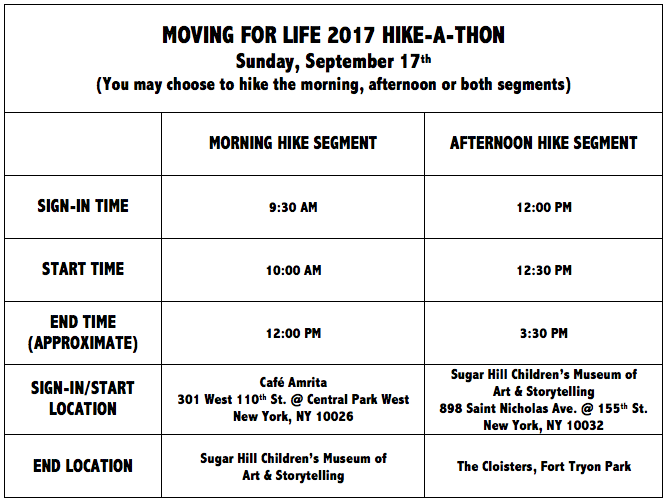 Afternoon Hike Segment Start Location Map: Sugar Hill Children's Museum of Art & Storytelling | 898 St. Nicholas Ave. @ 155th St.
Everybody gets a Moving For Life button. Hikers raising $100+ receive a Moving For Life button & backpack. Hikers raising $200+ Moving For Life button, backpack & hat.